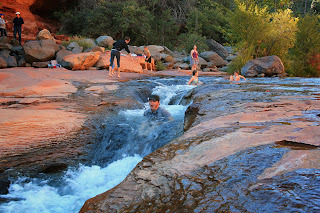 Slide Rock State Park is located just a few miles North of Sedona Arizona on route 89a. It's an insanely popular little park and one of the best swimming holes I've ever visited. Over the centuries, Oak Creek carved out and smoothed the rocks, creating a natural water slide and a few small waterfalls. There are several deep areas in the park where you can cliff jump when the level of the creek is high enough. It takes less than ten minutes to hike to the creek from the parking area, so the hike is suitable for almost anyone who can handle the flight of stairs that leads to the creek bed, but no pets. Besides the swimming area, Slide Rock State Park is filled with apple trees and historic cabins from the early 1900's. You can actually buy apples grown on the property from the gift store. The rest of the food selection was pretty limited. I would recommend bringing your own picnic supplies unless you want to eat canned nacho cheese or a microwaved corn dog. The creek was freezing in October, but it didn't seem to bother all the kids who were swimming, so I decided to hit the slide too. The rocks are covered in a sheen of algae and they're definitely as slick as advertised. 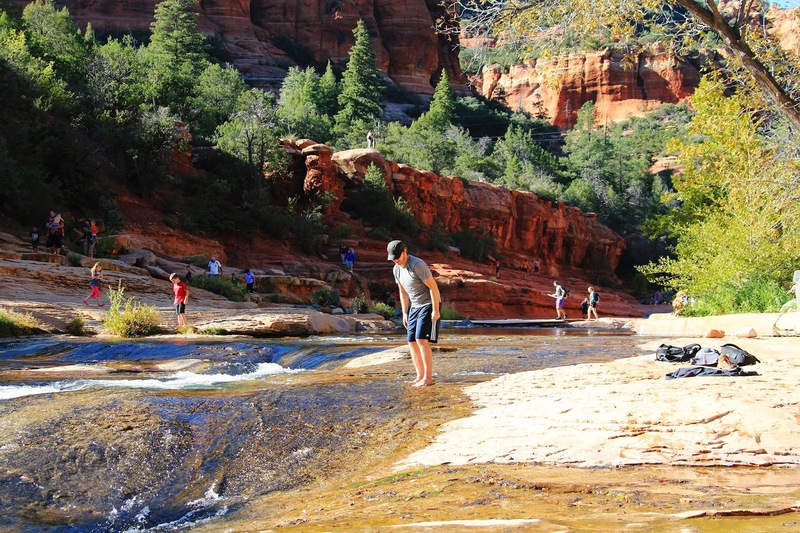 The park sits right in the middle of Oak Creek Canyon and the views alone were definitely worth the 10$ parking fee. I can tell by the humongous size of the parking area that Slide Rock must get insanely busy in the summer time. The parking area is seriously as big as the actual park itself. From Sedona, Head North on Route 89a for approximately 4 miles. Look for signs on 89a for Slide Park State Park. The entrance fee is 10$.